Some exciting news: I’ve been nominated for two blog awards, the Super Sweet Blogger Award (by Carissa from At 350 Degrees) and the Liebster Award (by Summer from Mallow&Co)! I’m so honored and excited, since my blog is really young, so thank you with all my sugar filled heart! I have to do a little research and nominate a bunch of other bloggers, so look out for my post soon! Also, Carissa and I are trading guest posts this weekend! 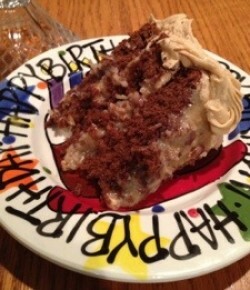 Click here to see my guest post on her blog and here to see her beautiful 5-Layer Ferrero Rocher cake! I thought I’d let everyone know a little more about me, if you’re new or if you’ve visited before. My blog is just a baby at a month old, but the experience of blogging has already made me a more conscious and creative baker. 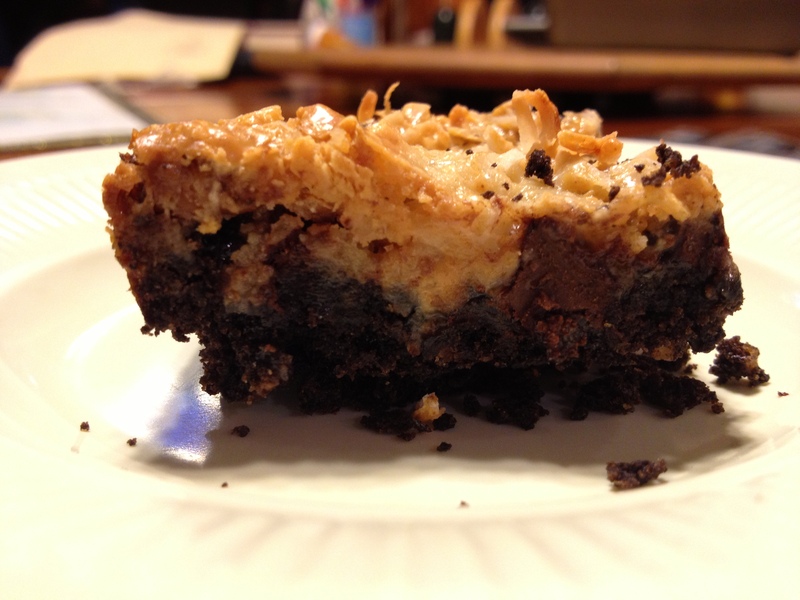 I have lots of ideas for the future, starting with these seven layer bars! 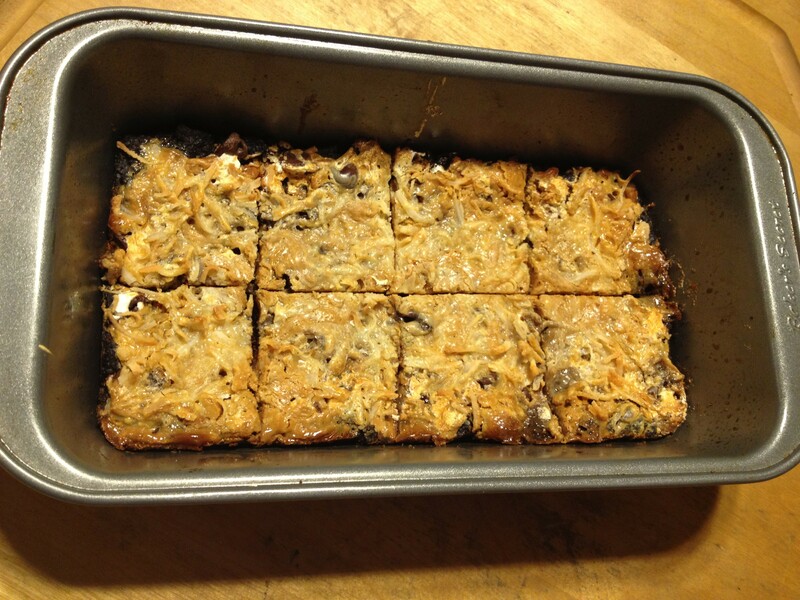 There are actually three names for this dessert: seven layer bars, magic cookie bars, and Hello Dolly bars. Why? No one seems to know. However, a cookie by any other name would taste as sweet. Love them, because they already love you. Preheat oven to 350 degrees. Line an 8×8 pan with parchment paper and grease with Pam. Combine crushed Oreos with butter or applesauce and press gently into the bottom of the pan. Microwave Fluff for 30 seconds or until liquidy and drizzle on top of crust, or sprinkle mini marshmallows all over crust. The Fluff re-hardens quickly, so you may need to pop it back into the microwave again. Microwave peanut butter for 30 seconds or until liquidy and drizzle over the pecans. Sprinkle chocolate chips and then coconut onto the peanut butter. Drizzle sweetened condensed milk as the final layer. Bake 25-30 minutes, until the top has lightly browned. Let cool completely and cut into bars. Conclusions: I loved these. Originally, I made them in a loaf pan and cut the recipe in half to test it, and ended up eating the entire batch (whoops). 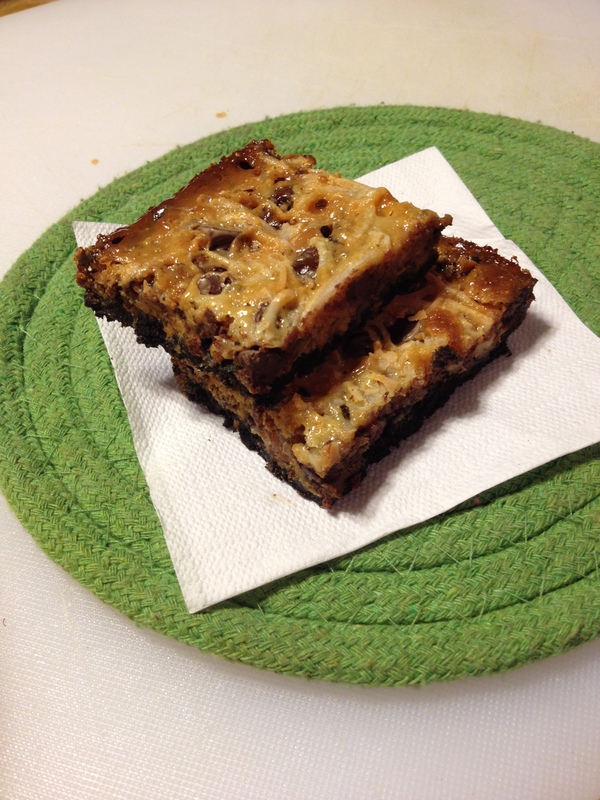 I’ve only had bona fide seven layer bars once, and I knew I needed to make them myself. These certainly fulfilled my craving.